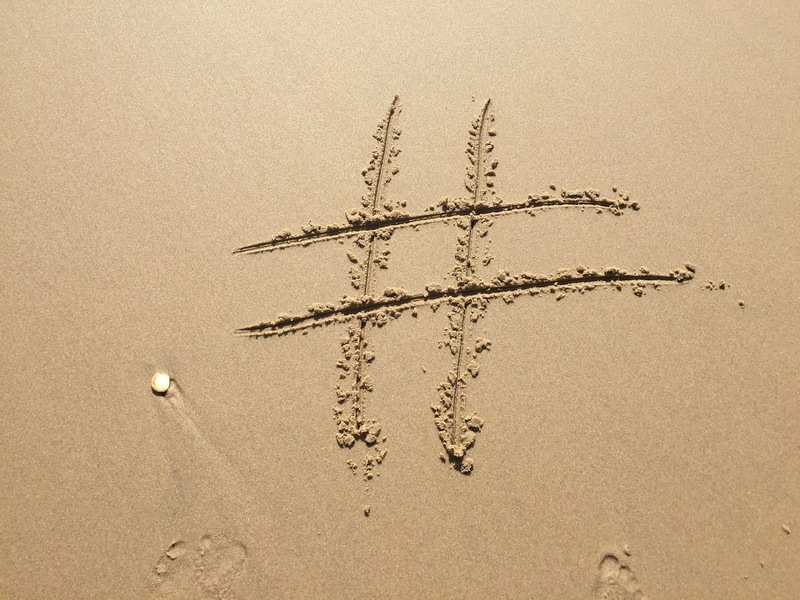 These days, hashtags are everywhere, but why use them and how? 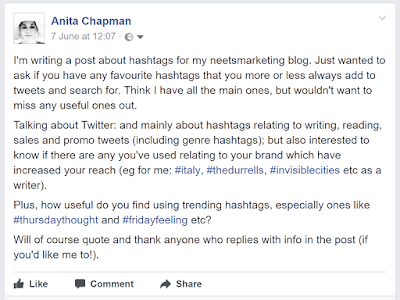 Many of my course attendees, and clients have said they find hashtags confusing, so I've written this post to explain what they are, how they work, and why it’s worth using them. Of course, it's not a good idea to fill tweets with an abundance of hashtags-a general rule is two in a tweet, three at the very most (if you really have to). Any more and your tweet looks like it wasn't produced by a real person. 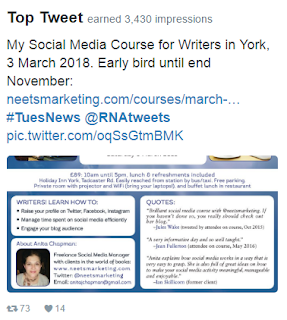 You can use several hashtags to promote a book or blog post etc by creating a few tweets, varying the hashtags in each, spreading them out over a few days. Don't forget that social media is about building relationships and sharing content which fits with your brand, rather than bombarding followers with only promo tweets. 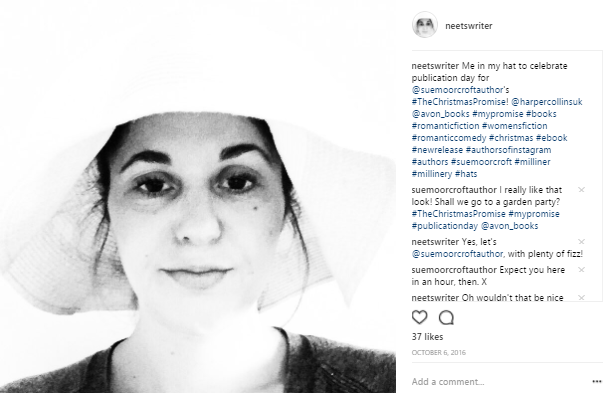 In this blog post, I'll be talking mainly about using hashtags on Twitter, with a little bit on Instagram and Facebook (see end of post), from the point of view of writers/authors. Twitter Support says: "A hashtag is any word or phrase immediately preceded by the # symbol. When you click or tap on a hashtag, you'll see other Tweets containing the same keyword or topic." Find out more here, via Twitter Support. Think of a hashtag like a reference, a way to reach beyond your followers; a way to find those with the same interests or attending the same event as you. Including hashtags relating to your brand in tweets (and searching for them) helps to increase discoverability. There is a lot more to hashtags, but I'll explain below. Brand: think about what defines you and your books, and aim to focus on those subjects and themes when posting on Twitter and Facebook. Use relevant hashtags on Twitter so people interested in those subjects and themes can find you (and use other hashtags to build relationships through shared interests). This is a way to gain potential readers as followers. Discoverability: find the places where people interested in subjects and themes from your books hang out. 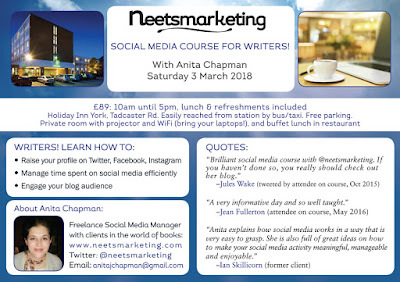 Join Facebook Groups, follow and use Twitter hashtags, follow and comment on blogs based around those subjects and themes. 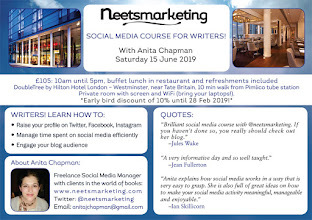 Liz Fenwick wrote a post for this blog, Using Twitter to Connect with Readers which gives great examples on how to find your potential readers using Twitter. Ask book bloggers (nicely) if they’ll review your book (check their review policy first), and/or host you on their blogs. Ask authors to host you on their blogs too. The more content you post online, the more likely you are to come up in a Google search. And backlinks are great for improving SEO ranking (a backlink is a link to your blog/website from another blog/website; especially great if that blog/website has lots of followers/page views). 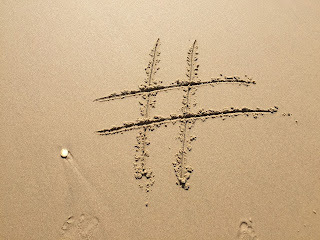 So, what's so great about hashtags?-main points. When searching for a hashtag (more below): you can find new people to follow: check hashtags which are relevant to you and your brand and you will find followers, and potential readers there. When adding a hashtag to tweets: your tweets will reach beyond your followers, and new followers will find you. Events: see who is attending an event in advance, raise your profile while you're there by tweeting updates, and tweet photos during/afterwards. Find out what's happening when you can't make an event. 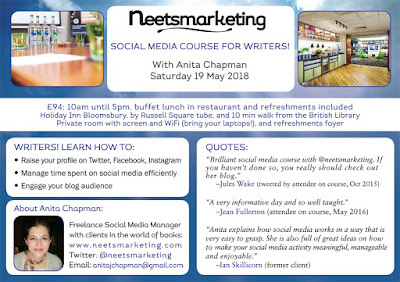 From experience, when promoting events-if an event is promoted well on Twitter (and Facebook, Instagram, with post-event blog posts etc), it helps to promote the next event. I've often received tweets when promoting an event along the lines of, "Wish I could be/could have been there. Must book next time/ Can I book for next time?" Build relationships through common interests. I've found new followers relating to my brand as a writer through hashtags like #invisiblecities #SecretsoftheNationalTrust and #thedurrells-TV programmes. Alison Baverstock talked about using #thearchers and other hashtags to build relationships through common interests at the RNA Conference 2015-see my post here. If you want to see how hashtags are working for you on Twitter: use Twitter analytics. Don’t just add hashtags to tweets and Instagram posts; search for hashtags too. An easy way to search for tweets using hashtags you want to keep an eye on is to add the hashtags to columns in Tweetdeck, or Hootsuite ((I'm a Tweetdeck fan, and have lots of columns for hashtags). With both Tweetdeck and Hootsuite, you can include more than one hashtag in a column by typing OR in between each hashtag, which can be useful if you want to monitor hashtags which are similar. Thank you so much to all who took the time to comment on my Facebook post with favourite hashtags: Emma Darwin, Mary Anne Lewis, Karen Aldous, Linda Green, Terri Nixon, Jenni Keer, Rebecca Lang, Phillipa Ashley. I've included names after those hashtags mentioned which I'd missed from my list. Here follow a few hashtags, especially used by writers/authors. I can't include them all, but do let me know if I've missed a popular one. The best way to find hashtags which will be useful to you is to look at tweets by your peers and idols-which hashtags are they using, and are those tweets receiving much engagement, ie likes, replies and retweets? Hashtags are not case sensitive. #bookconnectors: linked to the Book Connectors Facebook group for book bloggers and authors. Find out more in this guest interview with Anne Cater. Twitter account @Book_Connectors. #bookpost: lots of book bloggers use this with a photo of books received for review. #DDRevs: Disovering Diamonds reviews by Helen Hollick. Find out more in Helen's guest post here. When Sue Moorcroft's book, The Christmas Promise trended! 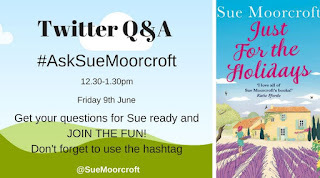 Sue Moorcroft has kindly given me permission to use her books #TheChristmasPromise and #JustfortheHolidays as examples of how to use hashtags for books. 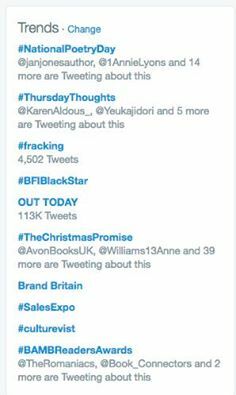 The Christmas Promise is a bestseller, which made it to the UK Kindle #1 spot before Christmas 2016. 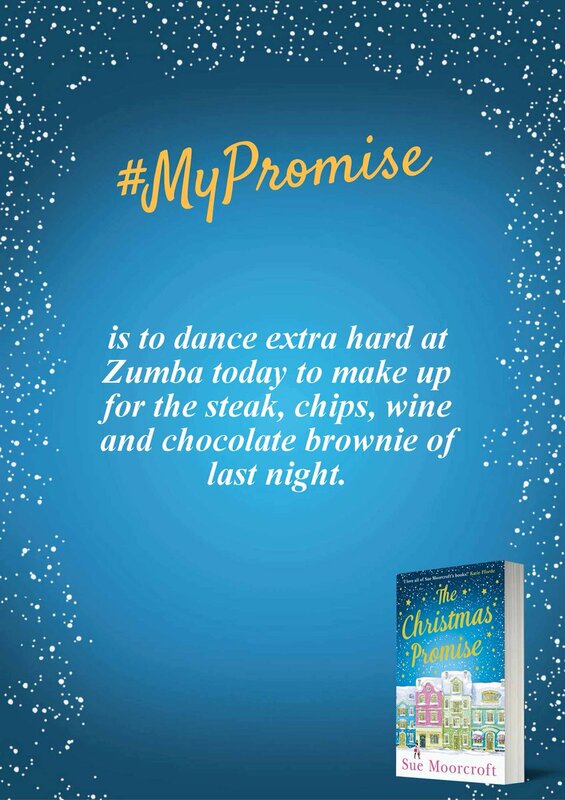 As the main character in The Christmas Promise, Ava is a milliner, members of Sue's Street Team posted photos of themselves wearing hats on social media with #TheChristmasPromise (that's where my profile photo comes from). 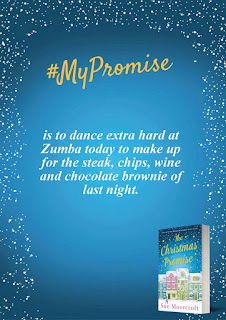 Also, Sue gave street team members the option to add wording to a banner with #MyPromise, to mention something they planned to do; silly promises included! Being near Christmas, there were a lot of promises to not overeat etc. With Sue's recent release, Just for the Holidays, Sue came up with the idea for members of her street team and followers to post old holiday photos on Twitter with #JustfortheHolidays. This proved to be a popular idea, and here I am with Sue at the RNA Summer Party on the day Just for the Holidays was released in paperback. Left: Sue and Catherine Miller. Right: me and Sue. These allow you to have a conversation about a particular subject, usually during set times. They can be an opportunity to ask an expert for advice, to chat generally, or for an author to answer questions from readers. 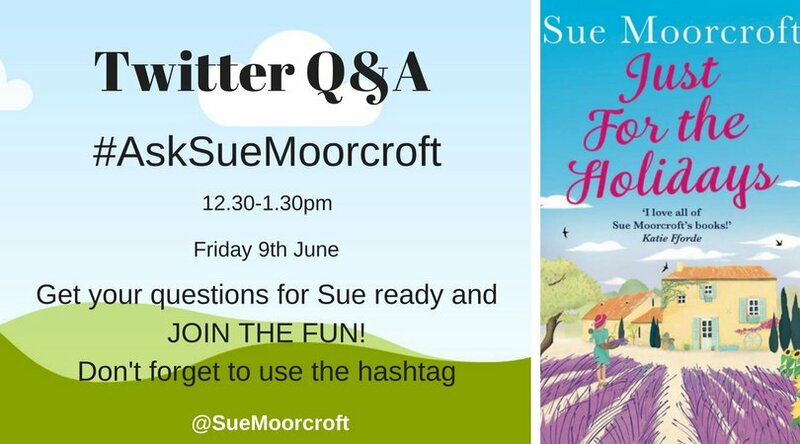 Sue Moorcroft has also kindly allowed me to use her Twitter chat from 9 June 2017, 12.30-1.30pm UK time: #AskSueMoorcroft as an example. Click here to see the tweets. #askagent: now and again, certain agents will answer questions within a set timeframe. Check the hashtag to find out more. #tenqueries: by @TheEricRuben, New York literary agent at The Ruben Agency. This hashtag gives an interesting insight into how agents make decisions on query submissions. #pitchcb: an opportunity to pitch, run by agencies, Curtis Brown and Conville and Walsh. Find out more here. #Poldark (used by Liz Fenwick, Phillipa Ashley, Terri Nixon). #ff. Meaning Follow Friday, where you can recommend who to follow (or others may recommend you). There are so many more hashtags out there: relating to season, location, gardening, food; everything you can imagine. Use hashtags for locations where your book is set, eg #Cornwall is used by Phillipa Ashley and #Tuscany by Karen Aldous (thanks both!). If you use one of these hashtags, there are usually rules and you are expected to reciprocate by retweeting other tweets using the hashtag. #MondayBlogs. Established and registered by bestselling author, Rachel Thompson @MondayBlogs. This article tells you all about it. #WWWblogs: see @Womenwriterblog bio for more info. This sharing news hashtag is used on Tuesdays by members (only) of the Romantic Novelists' Association, and reciprocation is expected in the same way as with blog sharing hashtags. 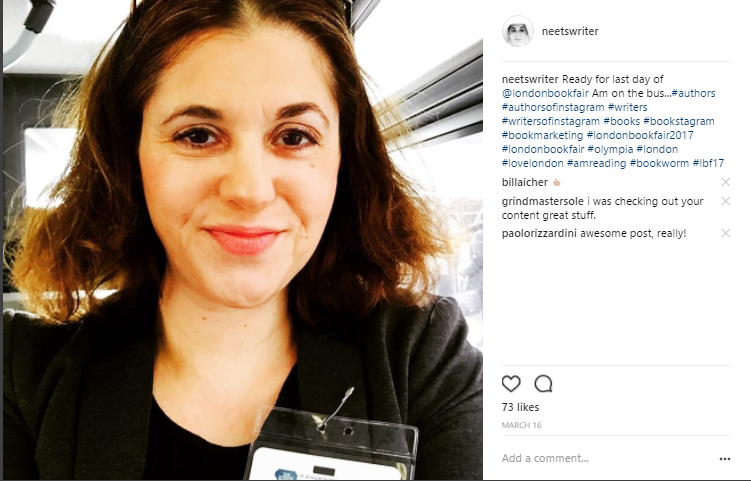 Members usually share news of cover reveals, pre-orders, special deals and giveaways, new releases, new contracts, blog posts, upcoming talks and launches etc. It's a really effective hashtag, and sometimes I receive 70+ retweets when I use it. 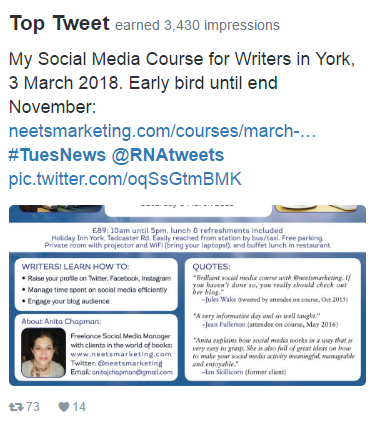 Don't forget to use @RNAtweets as well as the hashtag-RNA members know to search for both as per below. This is to avoid picking up other #TuesNews hashtags-sometimes there are a few of those. Use #TuesNews @RNAtweets (click on Latest in Twitter.com when searching to catch them all). 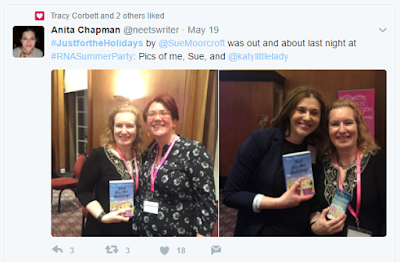 #HNSOxford16: Historical Novel Society conference, September 2016. I was publicity officer and Social Media Manager (handed over to Elaine Powell after the conf, 4 Sept 2016). See tweets here. #lbf17: London Book Fair, 2017. See my tweets here. 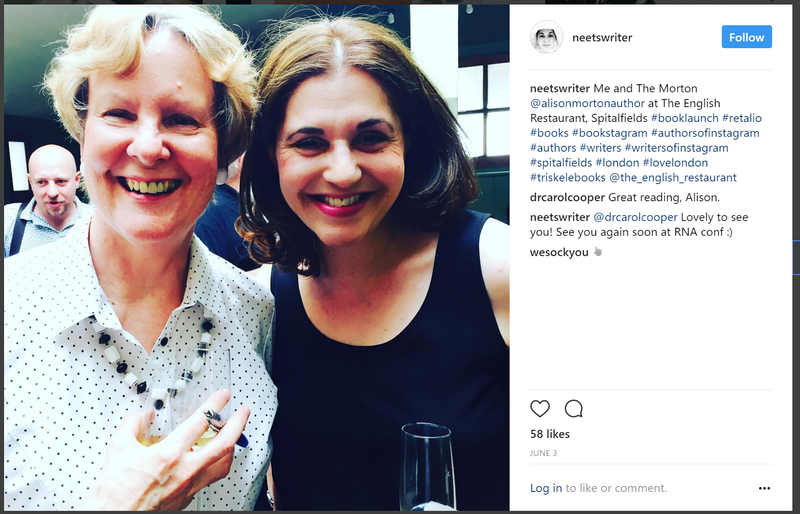 #rnasummerparty: Romantic Novelists' Association's Summer Party. See my tweets here. #neetsapr17. 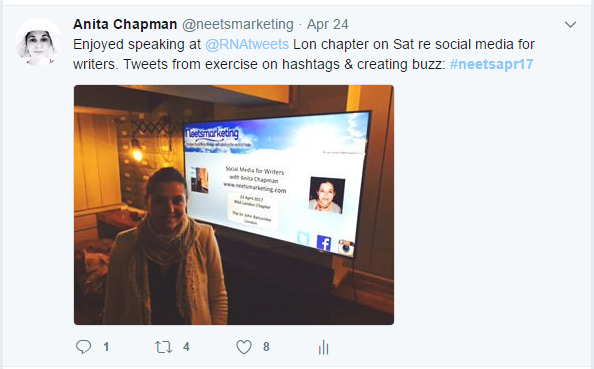 I created this hashtag for my talk to the RNA London chapter in April, so attendees could practise. See tweets here. #neetspring17. 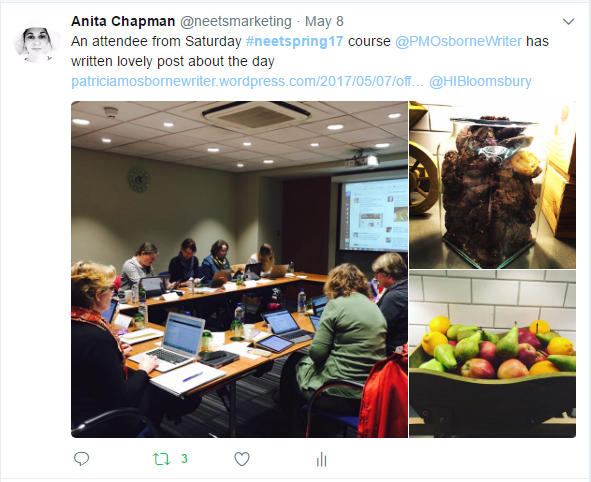 I created this hashtag for my May course in London so attendees could practise. See tweets here. What happens if you use the wrong hashtag? Those who you’re trying to reach are unlikely to see your tweet. I have seen this many times when promoting and following events on Twitter, and it's a shame for anyone who uses the wrong hashtag, as their tweets become redundant. Use the right hashtag! (do your research). How do you know which hashtag to use? Do your research. For example, if two (or more) are being used for an event, find the official hashtag being used by the person/organisation running the event; or if you can't find that info, which hashtag is being used the most and by those who usually know what they're doing on Twitter. A lot of the time, I see confusion between 20 and  for events, meaning that two are used eg #neetsapr2017 and #neetsapr17. If you organise an event, make it clear to your followers what the hashtag is way in advance of the event (include on flyers/banners/website etc), so by the time the event arrives, the hashtag will have been picked up by many of your followers. Don't make it difficult for followers to find the hashtag. I've attended events where a hashtag isn't being used or is created hastily during the event; a wasted opportunity. 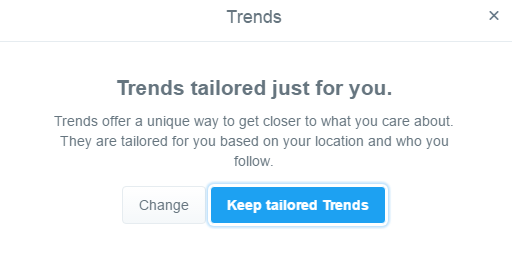 When you login to Twitter.com, you will see what's trending in your network. Twitter will tell you who in your network is tweeting using a trending hashtag. Find out more here, via Twitter Support. Using a trending hashtag can be a way to expand your reach, but sometimes these tweets can look unnatural, ie. it's obvious if someone's jumped onto a hashtag because it's trending (also be aware you can attract trolls depending on the hashtag and what you say). 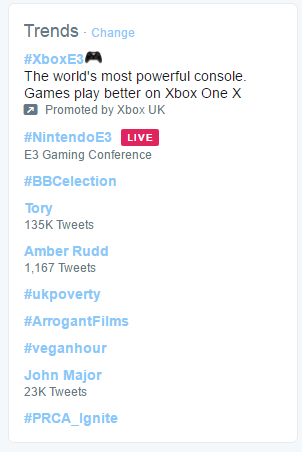 I have messed about with trending hashtags to see what happens, and often they receive little or no engagement. If the trending hashtag is for an event which many of your followers are attending, or for a book award etc, then you're likely to receive more engagement. If you click on Change, next to Trends (see above screenshot), you have the option to tailor what you see (see below screenshot). 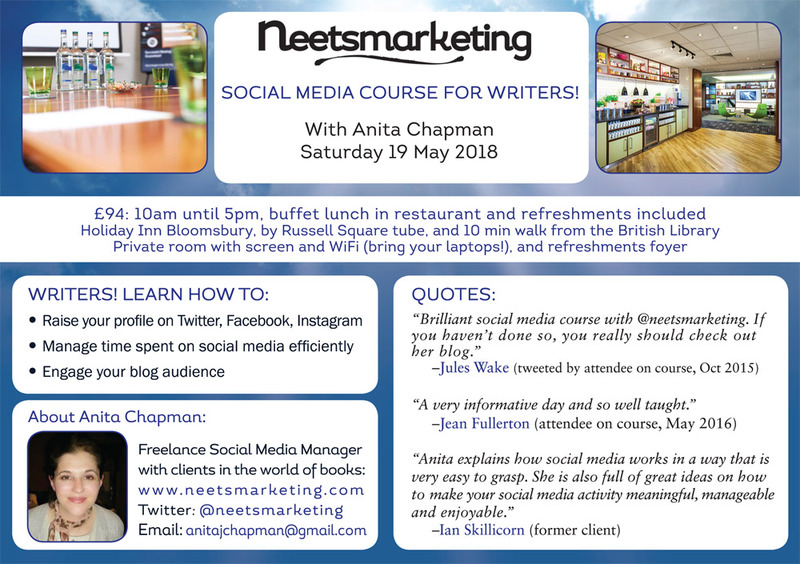 Try to make any hashtag you create easy to remember and relevant to your event, book, Twitter chat etc; and not too long so it doesn't take up a lot of space in tweets (where possible). Be careful to make sure your hashtag doesn't mean something else. Just read this article, via The Guardian on the Top 5 Twitter hashtag PR disasters to find out more. And check the hashtag you want to create isn't being used already, especially if it's being used for something you would not want your book etc to be associated with. Hashtags expand reach a great deal on Instagram, where it's seen as OK to use a number of them. Many hashtags on Instagram are the same as on Twitter, and there are lots of variations too. Look at who is using hashtags relating to your brand to find who to follow (as well as who your peers and idols are following). There are many more. Thanks to Linda Green for mentioning #bookstagram #bookworm and #bookaddict. Updated 23 August 2017: This is an interesting article re books on Instagram and celebrities, via The New York Times, and I'm adding #currentlyreading to the list above. 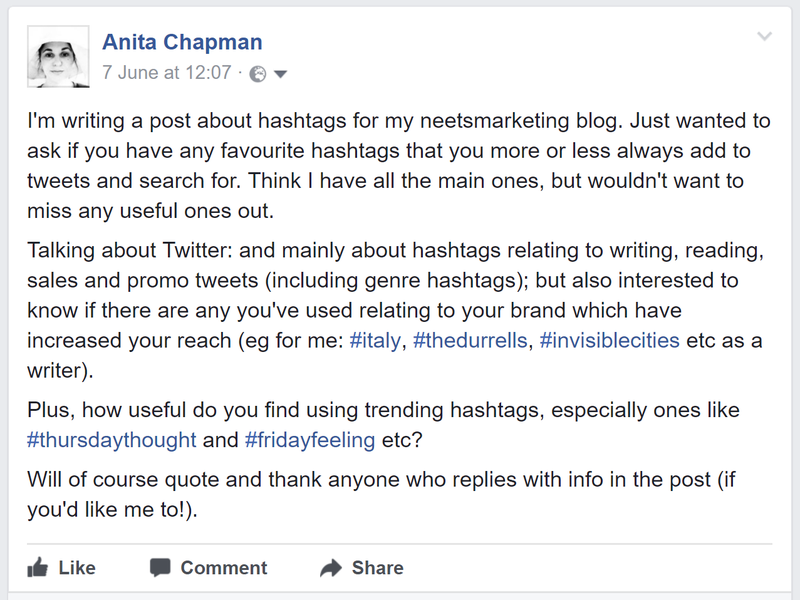 Hashtags are sometimes used on Facebook, but not in the same way, and according to Kevan Lee in this article via Buffer, How to Use Hashtags: How Many, Best Ones and Where to Use Them, hashtags don’t work effectively on Facebook. Kevan Lee says, "Facebook posts without a hashtag fare better than those with a hashtag." This article was written in 2015, but I can't find anything more up-to-date. I have found myself that using hashtags in Facebook posts hasn’t increased engagement. Andrew Hutchinson goes into more detail in this article, via Social Media Today, Should You Use Hashtags on Facebook? Here's What the Research Says, and he references Kevan Lee's post mentioned above. 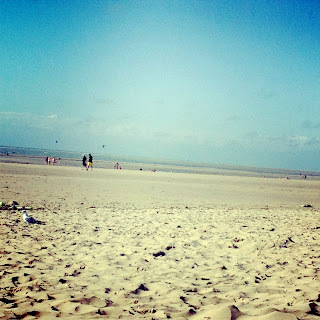 It's taken so long to write this post, I can't see it anymore! Hope it's helpful, and I can't possibly include all the hashtags relevant to you here, but do let me know if I've missed any big and obvious ones (sorry if I have!). I'm sure I'll remember loads more after I've published the post...will add them if that happens. More on Twitter here: My Beginner's Guide to Twitter for Writers 2017. Liz Fenwick on Using Twitter to Connect with Readers (guest post). My course on 7 October 2017 is now fully booked, but I'm running the same course on 19 May 2018. I shall be running my first Social Media Course for Writers in the North of England on 3 March 2018. More details here. 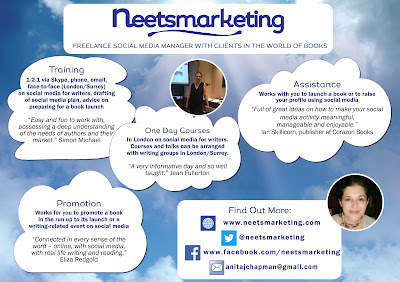 I work as a Freelance Social Media Manager with clients in the world of books. 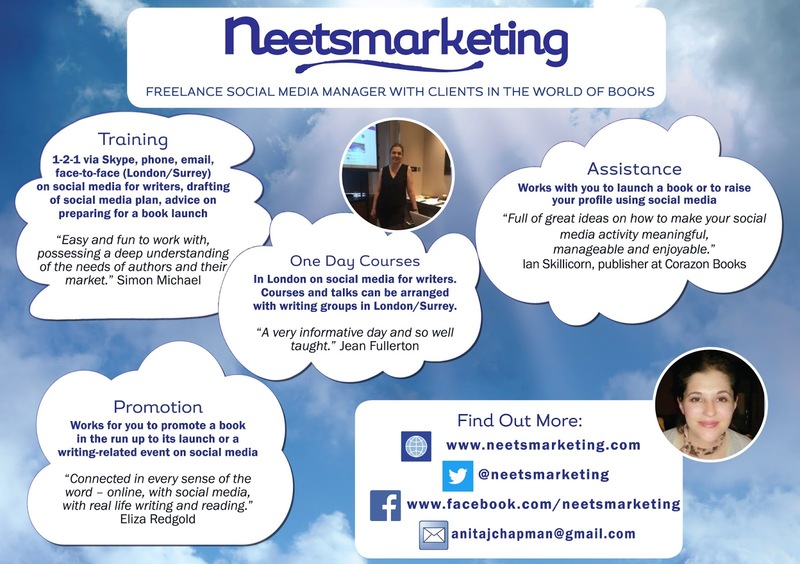 Here's a lovely new flyer on what I do, designed by Avalon Graphics (as are the flyers above). More info via my website.